MONDAY, Oct. 27, 2014 (HealthDay News) -- A mild concussion after age 65 might boost your risk of developing dementia, a new study suggests. Head injuries seem to pose special hazards for seniors compared to those in upper middle age, the researchers said. "This was surprising and suggests that the older brain may be especially vulnerable to traumatic brain injury, regardless of the traumatic brain injury severity," said study lead author Dr. Raquel Gardner, a clinical research fellow with San Francisco Veterans Affairs Medical Center. "Or to spin it more positively, the younger brain may be more resilient to mild traumatic brain injury or may take longer to show symptoms of dementia," she added. Whatever the case, she believes the findings should spur efforts to prevent head injuries among older adults. "Most doctors and patients understand the importance of preventing falls in order to prevent bodily injuries. This study suggests that fall prevention may not only prevent bodily injury, but may even help prevent dementia," she explained. It's not clear from the research how brain injuries could lead to dementia, and it doesn't prove that the injury actually caused mental decline. Gardner said she and other researchers launched the study to better understand the seeming link between brain injuries and dementia. "While many studies have shown that traumatic brain injuries in early life increase the chance of getting dementia, it has been harder to establish whether late-life injuries also increase the chance of getting dementia," she said. "This is a very important question because the highest rates of traumatic brain injury in this country are in older adults," she added. In the new study, researchers tracked nearly 52,000 emergency room patients in California from 2005 to 2011. All had suffered traumatic injuries of various types in 2005 or 2006 and were over the age of 55. While just under 6 percent of those with injuries outside the brain went on to develop dementia, more than 8 percent of those with moderate to mild traumatic brain injuries did so, the investigators found. At 55 and older, moderate to severe brain injury was associated with increased risk of dementia. But by 65 and older, even mild brain injury increased the dementia risk, the study authors said. "If a person falls and gets a traumatic brain injury, then they may be 26 percent more likely to get dementia than if they had fallen and broken their arm or leg," Gardner said. As for people who had more than one traumatic brain injury, the chance of getting dementia more than doubled, she said. But whether a person with a concussion recovers mentally or develops dementia likely depends on multiple factors ranging from genetics and medical conditions to environmental exposures and specific characteristics of the injury, the authors said. One limitation of the study is that it didn't include information on family history, prior illnesses and other head injuries, the authors acknowledged. It also doesn't identify the kind of dementia that developed or say anything about concussions in young people or the possible benefit of helmets. "Based on other studies, however, I would certainly counsel people of all ages to wear helmets whenever they are engaging in activities that are high-risk for traumatic brain injury or concussion such as downhill skiing, biking, or tackle football," Gardner said. "While it is still possible to get a concussion while wearing a helmet, it will generally be milder than if you weren't wearing one," she said. Kristen Dams-O'Connor, co-director of the Mount Sinai Brain Injury Research Center in New York City, praised the study but cautioned that head injuries don't guarantee dementia. "We do know that most traumatic brain injury survivors do not develop dementia," she said. "We also know that there are several things that are under a person's control that could lower the risk of developing dementia -- exercising, remaining [mentally] active, maintaining an active social life, staying involved with friends and family, attending regular primary care appointments and managing one's overall health," she added. "So my advice for our patients is to continue doing these things." Gardner said mysteries remain. "Does traumatic brain injury just remove a chunk of brain function and then cause a person to show earlier signs of the dementia that they were going to get anyway regardless of the injury? 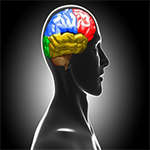 Does traumatic brain injury actually cause or accelerate degeneration of the brain?" she said. Future research should examine these issues, she added. For now, "I hope that these results will highlight the critical importance of preventing falls in older adults," Gardner said. The study appears in the Oct. 27 online edition of JAMA Neurology.